Basildon’s premier wasp nest removal company, WNR Essex are established as the best same day wasp nest extermination specialists in Basildon and the surrounding areas. Our pest control technicians are experienced and responsible in using wasp control solutions for residents and businesses in the Basildon area, utilising the best rated apparatus and pesticides in the world of pest management. If your home or business has a wasp or hornet nest infestation it can pose a genuine threat to your family or workforce. The termination of the nest is a job that should only be performed by skilled workers, as it is incredibly dangerous to approach a wasp nest yourself. A professional technician from our company will be equipped with the essential apparatus required to remove the nest. Wasps tend to position their breeding grounds in hard to reach places, including wall cavities and roof overhangs, so specialist equipment is needed to safely and successfully locate the nest. It is very important to react quickly, as a wasp sting is painful and for some people can even be life threatening. 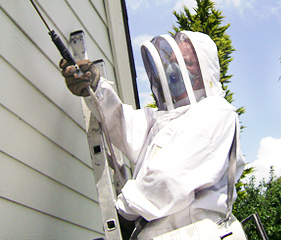 Throughout summer, we conduct our crew of wasp nest technicians in the Basildon area daily. This means we are able to arrive at your property within a few hours of contact, however if your schedule is busy on that day, we can time an appointment whenever is convenient for you. The first job when our technicians arrive will be a risk assessment that will both determine the location of your wasp nest infestation and provide the correct conditions for residents and pets to be protected from danger during the nest removal operation. This termination process happens swiftly, so after the application of a licensed commercial pesticide to the nest entry point, your return to the area is possible within an hour. Many councils have abolished their wasp nest removal service and multi-national corporations like Rentokil charge a lot more than we do for our high quality of service. The pesticides available in DIY stores or online will nowhere near compete with our pest removal products, which are exclusive to professional pest control companies. 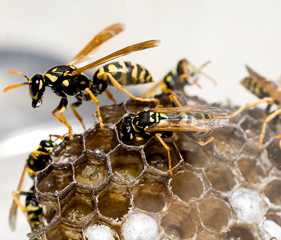 Although your home will be safe, a wasp nest could remain active for 24 hours after pesticide application, so please don’t approach the decontaminated area for a couple of days. Following treatment, wasps never come back to that nest, so it can be broken up and disposed of after this time. Our expert workforce delivers efficient nest termination to Basildon and the entire postcode area. We operate daily and a single visit to your property will see complete wasp nest extermination more than 95% of the time. In rare cases when a nest is not successfully terminated, we will return to administer treatment a second time, free of charge. WNR Essex wasp nest removal technicians operate seven days a week in Basildon and if needed, we consistently attend properties outside of working hours. After completion of the procedure our personnel will advise you how to avert re-infestation and will be prepared to answer your questions. Our crew of wasp and hornet nest removal technicians in Basildon await your call and are ready to resolve your wasp nest problem within the time frame of a few hours. Please thank Peter on our behalf, he turned up within an hour to help a damsel in distress. I will recommend to all our friends. Can you please call and help my neighbour. They have a very angry nest and I told her you're the man to help. Thanks for your help at such short notice. I can't believe I was quoted £300 by another company for the same job. Very professional and reliable service. Happy to have you on our list of approved contractors. © 2018 Copyright to Wasp Nest Removal Essex.